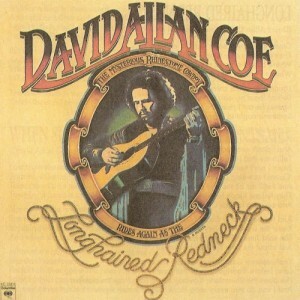 “Longhaired Redneck” is the title of a song co-written and recorded by American country music artist David Allan Coe. It was released in January 1976 as the lead single from Coe’s album of the same name. The song is notable for its direct reference to the “outlaw” movement in country music during the 70’s of which Coe was associated, as well as the chorus which features Coe impersonating classic country artists Ernest Tubb, “Whisperin'” Bill Anderson, and Merle Haggard. The song peaked at number 17 on the U.S. Billboard Hot Country Singles chart and at number 23 on the Canadian RPM Country Tracks chart. It was written by Coe with Jimmy Rabbitt, who is also a popular radio DJ in Texas.